This is for all the music lovers out there. Visit Gaana for the most amazing and endless collection of songs segregated into categories. You’ll find a new earworm in no time. You can even discover songs and play music in accordance with your mood. Songs always soothe the soul and there’s no end to how much good it does your mind. And you know what is the best way to listen to music on Gaana? With their amazing subscriptions! So here is something for people who love music: Gift Cards to unlimited music subscriptions! Check out the best deals on Gaana Gift Cards through GrabOn. Enjoy ad-free access to India’s largest collection of songs. Also, download and stream unlimited songs on your Android and iOS devices in HD quality with Gaana plus! Get your favourite music and discover great music all at your fingertips! You can gift someone the amazing Gift Card of subscription make their days wonderful! Good music is equal to great times. What Would You Be Gifting? With Gaana Gift Cards that offer subscriptions to Gaana Plus for the duration of one month, two month or six months, offers unlimited range of songs to choose from. You can also avail unlimited downloads via this subscription and stream songs in high definition! The best of all, the Gift Card gives way to an ad free experience to listening your favourite songs on the go. Could anything be better? Get the best gift for your friends, family and loved and dear ones by gifting them something they are going to cherish for a while. Get the best deals on Gaana Gift Cards and e-Gift Cards through GrabOn. Check them out now for the most profitable deal out there. 1. What does the Gaana Gift Card do? Gaana Gift Card lets the user access their favourite music offline with unlimited download option. There are different subscriptions one can choose from, subscription for one month, three months, six months or for a year. Gift your music loving friend a gaana gift card this season. 2. How do I buy Gaana Gift Card? 3. 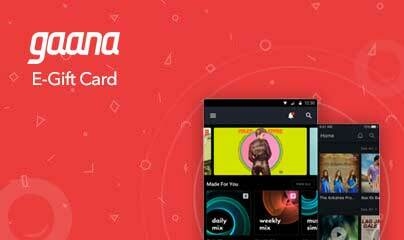 What are the types of Gaana Gift Card available? There is just one type of Gaana Gift Card available. The E- Gift Cards come with 1-month subscription, 3 months subscription, 6-month subscription or an year subscription. 4. How will I receive my Gift Card(s) after purchase and how long is my Gaana e-voucher valid? You'll receive your Gaana gift card in your email within 24 hours from the time we receive your payment. Please refer to the terms and conditions to know the validity of your gift card. 5. How can I redeem my Gaana Gift Card? All you have to do is enter your Gaana gift voucher number at the check out while making the payment of your order to redeem your gift card. It is that simple! 6. Can I use multiple Gift Card during one purchase? What happens if the transaction amount is lower than the balance in my Gift Card? No. You can only use one gift card during one transaction. The gift card comes with a specific subscription (based on monthly pack purchased). You can only use it to redeem the specified pack. 7. My transaction failed, and the amount has been deducted. What do I do? In such a case reach out to us as soon as possible and we will look into the matter and revert accordingly. Drop us a mail at giftcards@grabon.in or call us at 7997692233 and our team will get back to you. With this Gift Card, customers will get 12 months of Gaana subscription. An email with the Gift Card details will be sent to Customers upon purchase. The Gift Card is open to Indian residents above 18 years of age. Qwikcilver & Gaana.com reserves the right to terminate, modify or extend the timelines and features , at any time at its absolute discretion, without assigning any reason. Gift Card offers are subject to promotional availability. This Gift Card has no monetary value, is not transferable, is not for sale or re-sale nor redeemable for cash. Gaana accepts no responsibility, financial or otherwise for the misuse of the Gift Card.